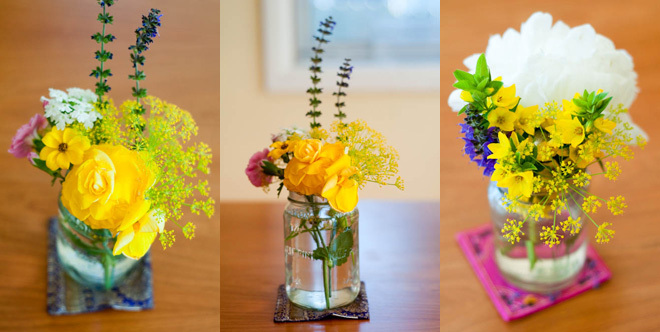 I’ve been having some fun lately creating mini mish-mash bouquets for our table. Whatever’s blooming has been a target. I have no eye for floral design. (Obviously, since I stuck a huge peony in with some tiny flowers!) I’m just going with what feels good and looks cheerful. They last a few days and then I go out and clip some more blooms. Our dill started sprouting delicate yellow flowers the other day and I just love them. So in they went as well. Next Next post: Ta-ta, spring!